The Washington Huskies football team represents the University of Washington in college football. Washington competes in the NCAA Division I Football Bowl Subdivision (FBS) as a member of the North Division of the Pac-12 Conference. The team is currently led by head coach Chris Petersen. Husky Stadium, located on campus, has served as the home field for Washington since 1920. Washington has won seventeen conference championships, seven Rose Bowls, and claims two national championships recognized by the NCAA. The school's all-time record ranks 20th by win percentage and 19th by total victories among FBS schools as of 2018. Washington holds the FBS record for the longest unbeaten streak at 64 consecutive games, as well as the second-longest winning streak at 40 wins in a row. There have been a total of twelve unbeaten seasons in school history, including seven perfect seasons. Washington is one of four charter members of what became the Pac-12 Conference and, along with California, is one of only two schools with uninterrupted membership. From 1977 through 2003, Washington had 27 consecutive non-losing seasons—the most of any team in the Pac-12 and the 14th longest streak by an NCAA Division I-A team. Through the 2017 season, its 390 conference victories rank second in conference history. Washington is often referred to as one of the top Quarterback U's due to the long history of quarterbacks playing in the National Football League (NFL), including the second-most QB starts in NFL history. Dating back to Warren Moon in 1976, 14 of the last 19 quarterbacks who have led the team in passing for at least one season have gone on to play in the NFL. Ten different men served as Washington head coaches during the first 18 seasons. While still an independent, the team progressed from playing 1 to 2 games per season to 10 matches per season as the sport grew in popularity. The school initially used a variety of locations for its home field. Home attendance grew from a few hundred to a few thousand per home game, with on-campus Denny Field becoming home from 1895 onward. The 1900 team played in-state rival Washington State College to a 5–5 tie, in the first game in the annual contest later known as the Apple Cup. Gil Dobie left North Dakota Agricultural and became Washington's head coach in 1908. Dobie coached for nine remarkable seasons at Washington, posting a 58–0–3 record. Dobie's career comprised virtually all of Washington's NCAA all-time longest 64-game unbeaten streak (outscoring opponents 1930 to 118) and included a 40-game winning streak, second longest in NCAA Division I-A/FBS history. In 1916, Washington and three other schools formed the Pacific Coast Conference, predecessor to the modern Pac-12 Conference. In Dobie's final season at Washington, his 1916 team won the PCC's inaugural conference championship. Dobie was inducted into the College Football Hall of Fame in 1951 as a charter member. Following Dobie's tenure, Washington turned to a succession of coaches with mixed results. Claude J. Hunt (1917, 1919) went a cumulative 6–3–1 highlighted by the school's second PCC championship in 1919, Tony Savage (1918) 1–1, and Stub Allison (1920) 1–5. This era concluded with the team's move from Denny Field to its permanent home field of Husky Stadium in 1920. Washington athletics adopted the initial nickname of Sun Dodgers in 1919 used until 1922, before becoming the Huskies from 1923 onward. Enoch Bagshaw graduated from Washington in 1907 as the school's first five-year letterman in football history. After leading Everett High School from 1909 to 1920, including consecutive national championships in 1919 and 1920, Bagshaw returned to Washington as the first former player turned head coach in 1921, ultimately overseeing the program's second period of sustained success. Bagshaw's tenure was marked by 63–22–6 record and the school's first two Rose Bowl berths, resulting in a 14–14 tie against Navy in the 1924 Rose Bowl and a 19–20 loss to Alabama in the 1926 Rose Bowl. His 1925 team won the school's third PCC championship. Bagshaw left the program after his 1929 team had a losing season, only the second such season in his tenure. Bagshaw died the following year at the age of 46. James Phelan succeeded Bagshaw for the 1930 season. The Notre Dame graduate guided the Huskies to a 65–37–8 record over 12 seasons. His 1936 team won the school's fourth PCC championship, but lost in the 1937 Rose Bowl to Pittsburgh 0–21. Phelan guided the Huskies to their first bowl game victory, beating Hawaii 53–13 in the 1938 Poi Bowl. In later years, he became the first former Husky head coach to take the same role in professional football. Phelan was inducted into the College Football Hall of Fame in 1973. Following Phelan, Washington fielded a succession of teams under four coaches without either great success, or failure. Washington participated in one bowl game and tallied no conference championships during this period with an overall record of 65–68–7. Ralph Welch played at Purdue under head coach James Phelan, whom he followed to Washington to become an assistant coach in 1930. In 1942, Welch was promoted to succeed Phelan as Washington's head coach and served until 1947, compiling a record of 27–20–3. World War II limited both the 1943 and 1944 seasons of the PCC, reducing team participation from ten team down to just four. Welch's 1943 team accepted the school's third Rose Bowl bid, but lost to PCC champion USC 0–29 in the 1944 Rose Bowl. Welch's first five teams all fielded winning records, but final 1947 team did not. Howard Odell joined Washington in 1948 from Yale. In his five seasons from 1948 to 1952, he compiled a record of 23–25–2 with two winning seasons. John Cherberg, a Washington player and then assistant from 1946 to 1952, became head coach in 1953. He compiled a 10–18–2 record from 1953 to 1955, before being removed due to a payoff scandal. Cherberg went on to become Washington state's longest serving Lieutenant Governor, from 1957 until his death in 1989. Darrell Royal was retained and led the 1956 team to a 5–5 record, before leaving to coach at Texas where he won three national championships, was inducted into the College Football Hall of Fame in 1983, and had the school's football stadium renamed in his honor as Darrell K Royal–Texas Memorial Stadium. In 1957, Jim Owens came to Washington after stints as an assistant with Paul "Bear" Bryant at Kentucky and Texas A&M. According to legend, after the 1956 season, when the Huskies were looking for a head coach, Bryant indicated to reporters that Owens "will make a great coach for somebody some day." Over 18 seasons, Owens would compile a 99–82–6 record. After a pair of unremarkable initial seasons, Owens led his 1959, 1960, and 1963 teams to three AAWU championships and associated Rose Bowl berths: a 1960 Rose Bowl 44–8 win over Wisconsin, a 1961 Rose Bowl 17–7 win over Minnesota, and a 7–17 loss to Illinois in the 1964 Rose Bowl. The Helms Athletic Foundation named the 1960 team the national champions, the school's first such title in football. Owens' later teams would never match this level of success, partly owing to a conference prevention of a second bowl team representative until 1975. Owens concurrently served as the athletic director at Washington from 1960 to 1969. Owens resigned as head coach of the Huskies following the 1974 season, as the Pac-8's third winningest coach of all-time. He was elected to the College Football Hall of Fame as a player in 1982. Don James came to Washington from Kent State. During his 18-year tenure, James' Huskies won four Rose Bowls and one Orange Bowl. His dominating 1991 Washington Huskies finished a perfect 12-0 season and won the national championship, which was shared with Miami. The Huskies won 22 consecutive games from 1990–1992. James' record with the Huskies was 153–57–2. James won national coach of the year honors in 1977, 1984 and 1991 and was inducted into the College Football Hall of Fame in 1997. Sports columnists and football experts have recognized the 1991 Washington Huskies among the top 10 college football teams of all time. During the 1992 season, it was revealed that several of James' players received improper benefits from boosters. The Huskies received sanctions from both the NCAA and then Pacific-10 Conference. Although James and his staff were not personally implicated in any violation, James resigned on August 22, 1993 in protest of the harsh sanctions the Pac-10 imposed on top of the NCAA's sanctions against his team. Though then University President William Gerberding and then Athletic Director Barbara Hedges had presented James the final list of penalties that all Pac-10 parties had agreed best for the football program and athletics, Gerberding argued in favor of altering the penalties against the program from a two-year TV revenue ban and one-year bowl ban, to a one-year TV revenue ban and two-year bowl ban. In a 2006 interview with columnist Blaine Newnham of The Seattle Times, Don James said his resignation from head coaching "probably saved his life". According to those who knew him, Don James was a great leader, a coach of character, a man of honor and integrity. Don James died on October 20, 2013, at the age of 80. A week later, the Huskies honored James during the game against California, which they won 41-17. On October 27, 2017, when the University of Washington unveiled a bronze statue of the legendary coach in the northwest plaza of Husky Stadium, "the Dawgfather" finally returned home. Jim Lambright was promoted from defensive coordinator to head coach following the sudden resignation by Don James. Lambright led the Huskies to four bowl appearances in his six seasons. Despite these bowl appearances and a 44–25–1 overall record, Lambright was fired by athletic director Barbara Hedges following the 1998 season after going 6–6. Rick Neuheisel was hired away from Colorado to take over as the Huskies' head football coach. During his tenure, the Huskies went 33–16, highlighted by a victory in the Rose Bowl in January 2001 over Purdue. Neuheisel also led the Huskies to two berths in the Holiday Bowl and to the Sun Bowl during his four-year tenure. Neuheisel was reprimanded by the NCAA for numerous recruiting violations. Neuheisel was fired in June 2003 after he admitted to taking part in a calcutta pool for the 2003 Men's NCAA basketball tournament. Neuheisel sued for wrongful termination, ultimately settling the case in March 2005 for $4.5 million, paid by the NCAA and Washington athletics department. Keith Gilbertson was promoted from offensive coordinator to head coach following Neuheisel's termination. The 2004 season, Gilbertson's first, ended with a 6–6 record but no bowl appearance. A 1–10 record the next year resulted in his firing. The 1–10 mark in 2004 was only Washington's second since the end of World War II. In two seasons, Gilbertson's record was 7–16. Former Stanford and Notre Dame head coach Tyrone Willingham was hired as the next head football coach of the Washington Huskies. The Huskies failed to post a winning record in any of Willingham's four seasons, the best being 5–7 in 2006. Willingham's record at Washington was a dismal 11–37, the worst winning percentage (.229) of any head football coach in Washington football history. Willingham was fired after a winless (0-12) 2008 season. USC offensive coordinator Steve Sarkisian was named the 23rd head football coach at Washington following the firing of Willingham. Sarkisian, known as an offensive mind and quarterbacks coach, led the Huskies to a 34–29 record over five seasons, never winning more than eight games in a year but recording just one losing season. Sarkisian departed after the 2013 regular season to return to USC as the head football coach, becoming the first head coach to voluntarily leave Washington for another program since Darrell Royal in 1956. Washington hired Chris Petersen as head football coach on December 6, 2013. Petersen previously spent eight seasons as the head coach at Boise State. Petersen led Washington to a Pac-12 title and a College Football Playoff appearance in 2016. On April 11, 2017, the Washington Huskies Athletic Department extended Petersen's coaching contract through 2023, with a reported annual salary of $4.875 million, paid entirely from Washington Athletic Department revenue, such as ticket sales and television rights or gifts. Washington finished the 2017 season with an invitation to participate in the 2017 Fiesta Bowl. In the 2018 season, Petersen led the Huskies to their second Pac-12 title in three years and Washington's 15th Rose Bowl appearance. Washington played its first 26 seasons of college football from 1889 to 1915 as an independent. In 1916, Washington became one of the four charter members of the Pacific Coast Conference (PCC), which later evolved into the modern day Pac-12 Conference after going through several iterations: the PCC (1916–1958), Athletic Association of Western Universities (1959–1967), Pacific-8 (1968–1977), Pacific-10 (1978–2010), and Pac-12 (2011–present). The Pac-12 claims the history of each of these preceding conferences as its own. Washington and California are the only founding and continuous members in each of these successive conferences. Washington has won five national championships, including four from NCAA-designated major selectors. In addition, sports and celebrity biographer Bill Libby chose the 1910 team as national champions in his book Champions of College Football. Washington recognizes all but the 1910 national championship. The 1960 team took an improbable road to the Rose Bowl and national championship. After suffering a 1-point setback to Navy in the third week of the season, the team reeled off eight straight wins capped by a triumph over #1 Minnesota in the Rose Bowl. Because the final Associated Press and United Press International polls were conducted after the final game of the regular season, Minnesota was named the AP and UPI national champion for 1960. In its poll conducted following bowl games, the Football Writers Association of America recognized Ole Miss as its national champion. The postseason poll conducted by the Helms Athletic Foundation recognizes Washington as national champions. The 1984 team opened the 1984 college football season with a 9–0 record which included a 20–11 win at #4 Michigan in Michigan Stadium. While ranked #1 in the AP poll, the Huskies dropped a 16–7 game to eventual Pac-10 champion USC, which cost Washington a chance at the Rose Bowl. The Huskies instead were invited to play in the Orange Bowl against the #2 Oklahoma Sooners. The game is famous for the Sooner Schooner incident. After Oklahoma kicked a field goal to take a 17–14 lead in the fourth quarter, a penalty was called on the Sooners that nullified the play. The Sooner Schooner driver, who didn't see the flag, drove the wagon on the field and was immediately flagged for unsportsmanlike conduct. The ensuing field goal attempt was blocked and led a momentum shift that saw Washington score two touchdowns in less than a minute en route to a 28–17 victory. Senior Jacque Robinson rushed for 135 yards and was named MVP, the first player in history to be named MVP of both the Orange and Rose Bowls. In winning, the Huskies became the first team from the Pac-10 to play in and win the Orange Bowl. The Huskies finished the year ranked #2 in the polls, behind the WAC champion Brigham Young (13–0–0) who were 24–17 victors over the unranked Michigan Wolverines (6–5–0) in the Holiday Bowl. BYU's title was notable for being the only time since the inception of the AP poll that a team was awarded the national title without beating an opponent ranked in the top 25 at the season's end. The Huskies were given the opportunity to play BYU in the Holiday Bowl but chose a larger bowl payout over playing a higher ranked opponent in BYU, who carried a 22-game win streak into the bowl season. The B (QPRS), FN, and NCF polls awarded Washington the national championship, which the school does not claim. The 1990 Huskies started out the season with wins against San Jose State and Purdue, then beat #5 USC by a score of 31–0. The next week fell to eventual AP national champion Colorado. After the loss, Washington went on to finish the season averaging over 40 points a game while only giving up 14. During this run, Washington would end up beating two more ranked teams on their way to the Rose Bowl. However, in the second to last game Washington lost to UCLA. Washington subsequently entered the Rose Bowl with a record of 9–2 against Iowa. The Huskies won by a final score of 46–34 to secure their fifth Rose Bowl title, displaying its trademark NCAA-best run-defense which allowed 66.8 yards per game. The AP awarded the national championship to Colorado, while the UPI chose undefeated Georgia Tech. Washington was ranked #5 in the AP poll, receiving no first place votes. The Rothman/FACT, active from 1968 to 2006, stated that the Washington Huskies were National Champions for 1990, sharing the honor with Colorado, Georgia Tech, and Miami. The school does not claim this championship. The 1991 Huskies opened the 1991 season on the road, with a 42–7 victory over the Stanford Cardinal. Following a bye week, Washington traveled to Lincoln, Nebraska for a showdown with #9 Nebraska. Trailing 21–9 late in the third quarter, Washington rallied to score 27 unanswered points and claim a 36–21 victory. The following week saw the return of QB Mark Brunell, the 1991 Rose Bowl MVP who had suffered a knee injury in the spring, as the Huskies beat Kansas State 56–3 while holding the Wildcats to -17 yards on the ground. The Huskies followed with back-to-back shutouts of Arizona and Toledo. The Huskies then traveled to Berkeley to face #7 California. Washington won a wild game that was decided on the final play when Walter Bailey broke up a pass on the goal line to preserve a 24–17 win. Oregon and Arizona State visited Husky Stadium next and each left with a loss. The Huskies went on their final road trip of the season, first to USC, where they won in the Los Angeles Memorial Coliseum for the first time since 1980. Needing a win over Oregon State to clinch a Rose Bowl berth, Washington rolled to a 58–6 victory. Washington State visited Seattle for the Apple Cup but were no match for the Huskies, as Washington won 56–21, setting up a showdown with Michigan in the Rose Bowl on January 1, 1992. The Washington defense, led by Lombardi Award and Outland Trophy winner Steve Emtman, held Michigan to only 205 total yards and limited 1991 Heisman Trophy winner Desmond Howard to only one catch. The Husky offense, led by quarterbacks Mark Brunell and Billy Joe Hobert, racked up 404 yards of total offense in leading the Huskies to a 34–14 Rose Bowl victory. Hobert and Emtman shared MVP honors. Steve Emtman (DT) and Mario Bailey (WR) were consensus All-American picks. Dave Hoffmann (LB) and Lincoln Kennedy (OT) were All-American selections. Don James was voted Pac-10 and National Coach of the Year. Steve Emtman was the Pac-10 Defensive Player of the Year and Mario Bailey was the Pac-10 Offensive Player of the Year. Mario Bailey (WR), Ed Cunningham (C), Steve Emtman (DT), Chico Fraley (LB), Dana Hall (CB), Dave Hoffmann (LB), Donald Jones (LB) and Lincoln Kennedy (OL) were First Team All-Pac-10. The Huskies led the NCAA in total defense for most of the year, allowing only 237.1 yards per game. The Huskies were voted national champions by the USA Today/CNN Coaches Poll, while the Miami Hurricanes topped the AP Poll. The 1991 team averaged over 41 points per game, only once scoring fewer than 20 points, and held opponents to an average of less than 10 points per game, including two shutouts. Washington has 7 Rose Bowl championships. The program been continuously affiliated with the Pac-12 Conference and its predecessors, which historically agreed to send a representative (typically the conference champion) to participate in the Rose Bowl. The Big Ten Conference was similarly contracted following World War II. This pairing made the Rose Bowl the most prestigious Bowl Game available to Pac-12 teams prior to the BCS era. Washington has won 17 conference championships, including the inaugural PCC championship in 1916. This total includes four PCC, three AAWU, one Pac-8, seven Pac-10, and two Pac-12 titles, and at least one in every decade except the 1940s. Washington's 17 conference championships is tied for second in league history, level with UCLA and behind USC's 38 as of 2018. Through the 2018 season, Washington has won three Pac-12 North Division titles. Washington has a bowl game record of 18–20–1 through the 2018 season, though the Poi Bowl game was not sanctioned by the NCAA. The Huskies' 15 Rose Bowl appearances are second only to USC in the Pac-12 while their seven victories are tied for third-most. In addition, Washington is also in an elite group of only seven schools to make three consecutive appearances in the Rose Bowl, a feat they accomplished in 1990–1992. Washington has won at least one Rose Bowl game in every decade since the 1960s. The Pacific-8 did not allow a second bowl team from the conference until 1975. Washington has made one appearance in the College Football Playoff. As of October 2018, Washington's records against conference opponents are as follows. Washington and Washington State first played each other in 1900. Traditionally, the Apple Cup is the final game of the regular season for both teams. The Apple Cup trophy has been presented to the winner of the game by the state's governor since 1962. Washington leads the series 73-32-6 as of the 2018 season. Washington and Oregon first met in 1900. Washington leads the series 60-46-5. Alaska Airlines Field at Husky Stadium, usually known simply as Husky Stadium, has served as the home football stadium for Washington since 1920. Located on campus and set next to Lake Washington, it is the largest stadium in the Pacific Northwest with a seating capacity of 70,083. Washington has led the modern Pac-10 Conference in game attendance 13 times, including nine consecutive seasons from 1989 to 1997. With nearly 70 percent of the seats located between the end zones and grandstands covered by cantilevered metal roofs, Husky Stadium is one of the loudest stadiums in the country and is the loudest recorded stadium in college football. During the 1992 night game against the Nebraska Cornhuskers, ESPN measured the noise level at about 135 decibels, the loudest mark in NCAA history. In 1968 the Huskies became the first major collegiate team to install an Astroturf field, following the lead of the Astrodome. Prior to the 2000 season, the school was among the leaders adopting FieldTurf, trailing only Memorial Stadium's installation by one season. A $280 million renovation of Husky Stadium began on November 7, 2011. Home games were moved to CenturyLink Field for the 2012 season while construction took place. The newly renovated Husky Stadium reopened on August 31, 2013 in a game in which the Huskies defeated Boise State by a score of 38–6. The Dempsey Indoor is an 80,000-square-foot (7,400 m2) facility opened in September 2001. The building is used as an indoor practice facility for Washington's football, softball, baseball and men's and women's soccer teams. Washington has worn variations of uniforms over the years but are most recognized for their traditional home uniform of gold helmets, purple jerseys, and gold pants. The school's athletic department is sponsored by Nike, whose contract runs through February 2019. Since Don James' first year as head coach in 1975, the Huskies have worn metallic gold helmets with a purple block "W" on both sides and white and purple center striping; he patterned the new helmet and uniforms after the San Francisco 49ers of the NFL. The exception was from 1995 to 1998 under Jim Lambright, when Washington wore solid purple helmets with a gold "W."
During Jim Owens' tenure, an outstanding defensive player was awarded the honor of wearing a purple helmet. Rick Redman, an All-American linebacker in the 1960s, wore one. It was rather intimidating for the opposing quarterback to stand behind his center and see this lone purple-helmeted player staring him down before each play. In 1973 and 1974, Owens' last two seasons, the entire team wore purple helmets. For the 2010 home finale against UCLA, the Huskies unveiled a "blackout" theme. The end zones of Husky Stadium were painted black, while the team debuted black jerseys and pants and encouraged the home crowd to dress in black as well. Two weeks later for the Apple Cup in Pullman, UW wore the black pants with the usual white road jersey. Black jerseys and pants were worn again the next month for the 2010 Holiday Bowl. All three games were Washington victories. In 2013, the Huskies debuted chrome gold helmets, worn with purple tops and bottoms in a rain-soaked match against Arizona. Later that season against Oregon, Washington debuted matte black helmets featuring a purple "W" and two truncated purple stripes. Prior to the 2014 season, Washington revealed a new uniform set that featured three jersey, four pant, and three helmet color options to allow for a myriad of combinations on the field. The set included matte gold, matte black, and "frosted" white helmets; purple, white, and black jerseys; and gold, purple, white, and black pants. The chrome gold helmets that had been introduced the previous season returned in the 2014 game against Arizona State. In 2017, chrome purple helmets were added to the uniform set. In April 2018, the school agreed to a new 10-year, $119 million apparel deal with Adidas set to begin in summer 2019, ending a 20-year partnership with Nike. The deal with Adidas will rank among the top-10 most valuable in college athletics. The University of Washington Husky Marching Band (HMB) is the marching band of the University of Washington, consisting 240 members. The 2017 season was the 88th for the HMB. The Huskies broadcast locally on KOMO-AM 1000 under the IMG Sports Network with Toni Castricone as the play-by-play announcer and former UW quarterback Damon Huard on color commentary. Bob Rondeau, known as the "Voice of the Huskies," announced Washington football for over 30 years until his retirement in 2017. As of July 2017, seven Washington players have ranked among top finishes in the Heisman Trophy voting. The program has retired three jersey numbers, though some have been re-issued for use. 15 former Washington players and coaches have been inducted into the College Football Hall of Fame, located in South Bend, Indiana. 3 former Washington players have been inducted into the Pro Football Hall of Fame, located in Canton, Ohio. As of 2010, Warren Moon (Edmonton Eskimos 1978–83) is the only player to be a member of both the Canadian Football Hall of Fame and the Pro Football Hall of Fame (NFL). The Rose Bowl has inducted eight Washington coaches and players into the Rose Bowl Game Hall of Fame. 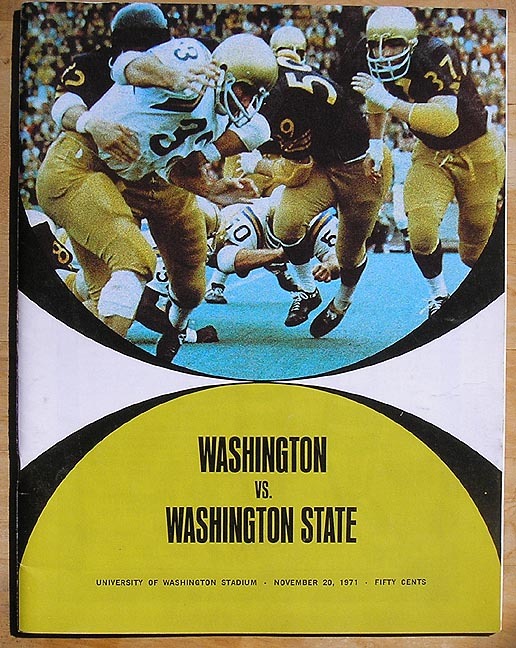 In the 1975 Apple Cup, Washington State led 27–14 with three minutes left in the game. WSU attempted a 4th-and-1 conversion at the UW 14-yard line rather than try for a field goal. The resulting pass was intercepted by Al Burleson and returned 93 yards for a touchdown. After a WSU three-and-out, Warren Moon's tipped pass was caught by Spider Gaines for a 78-yard touchdown reception and sealed a dramatic 28–27 win for Washington. WSU Head Coach Jim Sweeney resigned a week later, leaving with a 26–59–1 record. When 14th-ranked Washington State and 17th-ranked Washington met in the 1981 Apple Cup, it was billed as the biggest meeting in the series since the 1936 game when the winner was invited to the Rose Bowl. Washington's defense was the best in the conference, while the Cougars ranked high in offensive categories. Along with a win over WSU, the Huskies needed USC to upset UCLA, in a game that kicked off 40 minutes before the Apple Cup, to clear the way for a Rose Bowl bid. With his team trailing 7–3 late in the second quarter, Husky quarterback Steve Pelluer fired a low pass towards wideout Paul Skansi. Washington State cornerback Nate Brady looked as if he would smother the ball when Skansi dove over the defender for a catch in the endzone. Washington State drove the ball 69 yards to open the second half and tie the score at 10. From that point Washington, behind the fine play of their offensive line, took control. Ron "Cookie" Jackson capped an 80-yard drive by running 23 yards to put the Huskies ahead 17–10. Following a Cougar turnover, All-American kicker Chuck Nelson kicked his second field goal of the game to increase the Huskies' lead to 10 points. The fate of the Cougars was sealed when the score of the USC-UCLA game was announced- the Trojans had engineered the upset. Nelson added a field goal with less than three minutes to play, and the Huskies were off to the Rose Bowl. 1990 – "All I Saw Was Purple"
Heading into the 1990 season, the winner of the USC-Washington game had gone to the Rose Bowl in 10 of the previous 13 seasons. The 1990 match would continue that trend. Washington's All-Centennial team was introduced at halftime of the game, while two members of the historic team, Hugh McElhenny and Nesby Glasgow, delivered inspirational talks to the current players. On a bright, sunny day with the temperature reaching 92 degrees Fahrenheit, the crowd of 72,617 witnessed one of the most memorable games in program history. Washington shut out USC for just the third time in 23 seasons, handing the Trojans their worst conference defeat in 30 years. "Student Body Right" was held to only 28 rushing yards as the Husky defense dominated the line of scrimmage. Greg Lewis, the Doak Walker Award winner as the nation's top running back, gained 126 rushing yards as sophomore quarterback Mark Brunell threw for 197 yards for the Huskies, as they rolled to a 24–0 halftime lead. The Husky defense, led by All-American lineman Steve Emtman, stopped everything the Trojans attempted. The defense would hold USC to 163 total yards and seven first downs for the game. They would record three sacks and put so much pressure on Todd Marinovich that after the game, weary and beaten, he famously said: "I just saw purple. That's all. No numbers, just purple." 1992 – "A Night To Remember"
Playing in the first night in stadium history, #2 Washington posted a victory against #12 Nebraska that provided the loudest recorded moment in the history of Husky Stadium and would be dubbed "A Night To Remember." Late in the first quarter, Husky punter John Werdel pinned Nebraska on its three yard-line. Crowd noise caused the Husker linemen to false start on consecutive plays, only adding to the frenzy of the crowd. When Nebraska quarterback Mike Grant dropped back to his own end zone to attempt a pass, Husky roverback Tommie Smith blitzed Grant from his blind side and tackled him for a safety. The deafening roar following the play reverberated off the twin roofs of the stadium. ESPN measured the noise level at over 130 decibels, well above the threshold of pain. The peak recorded level of 133.6 decibels has been the highest ever recorded at a college football stadium. Holding a 9–7 lead, the Husky offense went into quick-strike mode at the close of the second quarter. Speedy running back Napoleon Kaufman ended an 80-yard drive with a 1-yard scoring run. Walter Bailey intercepted Grant to start the second half, and the Huskies extended their lead when quarterback Billy Joe Hobert threw a 24-yard touchdown pass to a diving Joe Kralik to boost the lead to 23–7. Kicker Travis Hanson later made a pair of field goals second half to cinch a 29–14 win. The victory propelled Washington to the #1 ranking in the AP poll the following week. 1994 – The "Whammy in Miami"
The 'Whammy in Miami' was a college football game played between the Huskies and the Miami Hurricanes on September 24, 1994 in Miami's Orange Bowl. The game was the first football contest between the two schools. During the 1991 season, both teams finished the year with identical 12–0 records and both teams were crowned National Champions by different polls. The teams were unable to settle the championship on the field, as both teams were locked into their respective bowl games (Washington in the Rose and Miami in the Orange). As a result, both schools agreed to schedule the other for a series of games. Entering the game, Miami had an NCAA record home winning streak of 58 games and was ranked 5th in the nation with a 2–0 record. The Hurricanes had not lost at the Orange Bowl since 1985 and not to a team from outside of Florida since 1984. The Huskies were 1–1, having lost to USC and beaten Ohio State. Odds makers placed the Huskies as a 14-point underdog. The Hurricanes appeared to be on their way to a 59th consecutive home victory in the first half, leading the Huskies 14–3 at halftime. After the half, the Huskies came out firing by scoring 22 points in five minutes. Key plays included a 75-yard touchdown pass, 34-yard interception return, and a fumble recovery. The Huskies dominated the second half on the way to a 38–20 victory. Word got out among the Huskies that Miami Coach Dennis Erickson had jokingly suggested the losers of this game relinquish their national championship rings from 1991. "Take the rings back," safety Lawyer Milloy shouted into the air as he walked off the field. With the game in Pullman, #3 Washington State entered the game poised for BCS National Championship game consideration, behind QB Jason Gesser. Gesser was injured by DT Terry "Tank" Johnson late in the game. The Cougars led 20–10 with less than 4 minutes left in the game, with Matt Kegel having replacing Gesser. UW used a timely interception from freshman cornerback Nate Robinson to force overtime. The teams traded field goals in the first two overtime periods, and John Anderson converted another kick to start the third overtime. During the Cougars' possession, umpire Gordon Riese controversially ruled that Kegel threw a backward pass, which was knocked down and recovered by defensive end Kai Ellis. The fumble recovery ended the game as a Washington victory. The Martin Stadium crowd erupted angrily in response, and some individuals threw bottles on the field as Washington players and fans celebrated. Then UW athletic director Barbara Hedges said at the time that she "feared for her life." 2009 – "Miracle on Montlake"
Entering the game, the #3 Trojans had the national spotlight after their defeat of Ohio State in Columbus the week before. Washington, meanwhile, had just won its first game in 16 contests with a victory over Idaho. Southern California opened the game with 10 unanswered points, marching down the field with ease. USC was playing without starting quarterback Matt Barkley, who had injured his shoulder the week before at Ohio State, but despite playing with backup QB Aaron Corp, the Trojans were able to lean on an experienced running game and veteran offensive line. Washington worked its way back into the game with a 4-yard touchdown run by quarterback Jake Locker, trimming the score to 10–7. Late in the second quarter, placekicker Erik Folk kicked a 46-yard field goal to tie the score at 10. The scored remained tied as the game entered the fourth quarter. After swapping field goals, the Huskies took possession with four minutes left in the game. Locker maneuvered the Huskies down the field, converting on two key third downs, including a 3rd-and-15 from his team's own 28 where Locker threw across the sideline to Jermaine Kearse for 21 yards. The Huskies would eventually drive to the USC 4-yard line before Folk kicked the game-winning field goal for the 16–13 victory, Washington's first conference win since 2007. On October 2, 2010 the Huskies went on the road to face #18 USC at Los Angeles Memorial Coliseum, a place where they had not won since 1996. They hadn't won on the road period since November 3, 2007 against Stanford, a streak of 13 consecutive games. The Huskies led for parts of all four quarters but never put the game away, including a play in which Jake Locker had the ball stripped out of the end-zone on what was a sure touchdown run. Locker left the game for one play after taking a knee to helmet on a quarterback sneak. Keith Price, a redshirt freshman from Compton, California, came in to make his Washington debut and completed a touchdown pass on his only play of the game, putting the Huskies ahead 29–28. The Trojans made a field goal on the following possession to retake the lead, 31–29. The Huskies' final drive started with two incomplete passes and a near fumble, but on a 4th-and-11 Jake Locker completed a pass to a leaping DeAndre Goodwin. The Huskies continued to push the ball into field goal range in a similar situation to the previous year when playing USC. With 3 seconds left, Erik Folk kicked the game-winning field goal as time expired, giving the Huskies their first road win in three years. 2016 — "70 In Eugene"
Prior to this game, Oregon had beaten Washington twelve straight times, ten of which were by a margin of 20 points or more. This was the longest winning streak by either team in the Oregon-Washington football rivalry.The Huskies, ranked #5 in the AP Poll after a 44–6 win against #7 Stanford at Husky Stadium the previous week, traveled to Autzen Stadium to face a 2–3 Oregon team. The Oregon winning streak was finally snapped after a 70–21 Washington rout. On the first play from scrimmage, Washington safety Budda Baker, a one-time commit to Oregon, intercepted a pass from Oregon true freshman quarterback Justin Herbert. The Huskies took the lead on a Jake Browning touchdown run with 13:23 left in the first quarter and never relinquished it. The Huskies led 35–7 by halftime, 42–7 after the first possession of the third quarter, and 70–21 with 9:58 left in the fourth quarter. The Washington offense racked up 682 yards of total offense, averaged 10.1 yards per play, amassed 6 passing touchdowns by quarterback Jake Browning, and scored 70 points, the most scored by either team in the rivalry. This was also the second-most an opponent has ever scored on Oregon in Eugene. As of February 2019, the coaching staff is as follows. Announced schedules as of November 15, 2018. The school years of 2022-23, 2023–24, and 2026–27 do not have any scheduled non-conference opponents as of March 31, 2018. ^ a b Jude, Adam (October 25, 2017). "'It's time for everybody to man up': How the Huskies plan to replace All-Pac-12 left tackle Trey Adams". www.seattletimes.com. The Seattle Times. Retrieved January 17, 2018. ^ a b c d e f g "Football Records Books (since 2004)". www.ncaa.org. National Collegiate Athletic Association. Retrieved January 20, 2018. ^ a b c d "2018 record book" (PDF). gohuskies.com. Washington Athletics. July 23, 2018. Retrieved February 22, 2019. ^ a b c d e f g "Pac-12 Football History". pac-12.com. Pac-12 Conference. Retrieved January 23, 2018. ^ "Quarterback U: Which school deserves the title?". Altoona Mirror. Retrieved February 6, 2013. ^ Pinto, Michael (November 7, 2010). "Quarterback U: Top 25 Quarterback Schools in College Football". bleacherreport.com. Bleacher Report. Retrieved January 20, 2018. ^ a b Johnson, Derek (July 24, 2007). "Dobie, Gilmore (d. 1948)". historylink.org. ^ "Player Bio: Claude Hunt – University of Washington Official Athletic Site". Gohuskies.com. Archived from the original on February 16, 2013. Retrieved February 13, 2013. ^ "University of Washington Official Athletic Site – Traditions". Gohuskies.com. February 3, 1922. Archived from the original on March 6, 2012. Retrieved February 13, 2013. ^ David Eskenazi. "Wayback Machine: Bagshaw's roaring Twenties | Sportspress Northwest". Sportspressnw.com. Retrieved February 13, 2013. ^ "Player Bio: Enoch Bagshaw – University of Washington Official Athletic Site". Gohuskies.com. October 3, 1930. Archived from the original on March 6, 2012. Retrieved February 13, 2013. ^ "Player Bio: James Phelan – University of Washington Official Athletic Site". Gohuskies.com. November 14, 1979. Archived from the original on April 26, 2012. Retrieved February 13, 2013. ^ "Darrell Royal, Former Husky Coach (1924–12)". SportsPressNW.com. November 7, 2012. ^ "Past Presidents of the Senate - Lieutenant Governors of Washington State". leg.wa.gov. Washington State Legislature. Retrieved January 28, 2018. ^ Withers, Bud (June 7, 2009). "Jim Owens, coaching legend of UW football, dies at 82". www.seattletimes.com. The Seattle Times. Retrieved January 28, 2018. ^ Linde, Richard. "Jim Owens, The "Big Fella"". Retrieved January 20, 2018. ^ "College Football Hall of Fame Jim Owen Dies". National Football Foundation. June 8, 2009. Retrieved February 6, 2013. ^ Kelley, Mason (September 29, 2016). "The Details: National Champions Won as One". GoHuskies.com. ^ Condotta, Bob (August 22, 2011). "Perfect 1991 Huskies won national football title, set the standard for all UW teams". The Seattle Times | seattletimes.com. ^ a b "University of Washington Coaching Records". Cfbdatawarehouse.com. Retrieved October 11, 2018. ^ "The 1991 season produced two national champions... but only one all-time great team". Football Study Hall | footballstudyhall.com. April 28, 2016. ^ Jude, Adam (October 26, 2016). "UW 1991 flashback: Are the Huskies the best Pac-10 team ever?". The Seattle Times | seattletimes.com. ^ "Best College Football Teams". ESPN. ^ Johnson, Derek (2007). Husky Football in the Don James Era. https://www.amazon.com/Husky-Football-Don-James-Era/dp/0979327105. ISBN 9780979327100. ^ Munson, Carl (December 9, 2011). "The Betrayal: Don James". The Husky Haul | thehuskyhaul.com. ^ "William Gerberding 1929 -2014, fmr UW President Was Architect Of Husky Football's Demise". UW Dawg Pound | uwdawgpound.com. January 9, 2015. ^ Samek, Dave (August 29, 2004). "The Roses of Wrath". UW Dawg Pound | uwdawgpound.com. ^ Newnham, Blaine (May 28, 2006). "Don James says quitting UW probably saved his life". The Seattle Times | seattletimes.com. ^ Uthman, Daniel (December 28, 2016). "What Nick Saban learned from Washington's greatest coach". www.usatoday.com. USA Today. Retrieved January 19, 2018. ^ DeGrasse, Kirk (October 10, 2013). "Remembering Don James-Part One". www.uwdawgpound.com. SB Nation. Retrieved January 19, 2018. ^ DeGrasse, Kirk (October 22, 2013). "Remembering Don James-Part Two". www.uwdawgpound.com. SB Nation. Retrieved January 19, 2018. ^ Yardley, William (October 22, 2013). "Don James, Longtime Washington Huskies Football Coach, Dies at 80". The New York Times. Retrieved January 18, 2016. ^ Bell, Gregg (October 27, 2013). "The Dawgfather Would Have Been Proud Of This". gohuskies.com. Washington Athletics. Retrieved January 19, 2018. ^ Stone, Larry (October 27, 2017). "Big man on campus: 8-foot-6 Don James statue will forever stand tall at UW". The Seattle Times | seattletimes.com. ^ "Lambright Fired After 6-6 Season". www.nytimes.com. The Associated Press. December 31, 1998. Retrieved January 28, 2018. ^ Baker, Mike (February 15, 2015). "Neuheisel describes 'devastating' termination". www.dailyuw.com. The Daily of the University of Washington. Retrieved January 27, 2018. ^ "Neuheisel said he feels vindicated by settlement". www.espn.com. The Associated Press. March 8, 2005. Retrieved September 12, 2016. ^ Raley, Dan (October 31, 2004). "Gilbertson ousted as UW coach". www.seattlepi.com. Seattle Post-Intelligencer. Retrieved January 28, 2018. ^ "Washington finishes 0-12 season with loss to Cal". www.seattletimes.com. The Associated Press. December 6, 2008. Retrieved January 28, 2018. ^ a b "USC hires Steve Sarkisian as coach". www.espn.com. ESPN.com news services. December 3, 2013. Retrieved September 12, 2016. ^ Bell, Gregg (December 9, 2013). "Petersen On UW: This Is Where I Needed To Be". GoHuskies.com. ^ "Washington hires Chris Petersen". www.espn.com. ESPN.com news services. December 6, 2013. Retrieved January 28, 2018. ^ Jude, Adam (December 9, 2013). "Huskies enjoy introducing their 'dream hire' in Chris Petersen". The Seattle Times | seattletimes.com. ^ Jude, Adam (April 11, 2017). "UW releases contract details for Chris Petersen, assistant coaches". The Seattle Times | seattletimes.com. ^ Thamel, Pete (April 10, 2017). "Washington extends Petersen's contract". Sports Illustrated. SI.com. ^ Gordon Blankinship, Donna. "Coaches are best-paid state employees in Washington". KOMO News | komonews.com. ^ Christopher J. Walsh (2007). Who's #1? : 100-Plus Years of Controversial National Champions in College Football. Taylor Trade Pub. pp. 98–99. ISBN 978-1-58979-337-8. ^ 2018 NCAA Football Bowl Subdivision Records (PDF). National Collegiate Athletic Association. August 2018. pp. 113–114. Retrieved December 10, 2018. ^ 2018 Husky Football Guide (PDF). University of Washington Athletic Communications Office. 2018. p. 86. Retrieved February 21, 2019. ^ a b "2009 Football: Pac-10 Champions, Annual Individual Statistical Champions" (PDF). CBS Sports. ^ "1990 Final AP Football Poll". collegepollarchive.com. College Poll Archive. Retrieved January 28, 2018. ^ "Rothman's FACT Rankings". David Rothman. Retrieved December 28, 2009. ^ "Tournament of Roses Media resources". www.tournamentofroses.com. Pasadena Tournament of Roses. Retrieved January 17, 2018. ^ "Pac-12 Conference - 2017 Football Media Guide". Catalog.e-digitaleditions.com. 2017. p. 92. Retrieved February 8, 2018. ^ "Washington Huskies Bowls". College Football at Sports-Reference.com. ^ Richard J. Shmelter (April 23, 2014). The USC Trojans Football Encyclopedia. McFarland. p. 36. ISBN 978-0-7864-6950-5. The Poi Bowl was designed to invite football programs from the Pacific Coast Conference, with the exception being in 1937, to come a[sic] play against the University of Hawaii. This game was considered a College Division/Minor Bowl Game, and recognized as just a regular season contest by both the NCAA and USC. ^ "Washington Huskies head-to-head records". Winspedia.com. Hazzah LLC. October 27, 2018. Retrieved September 23, 2018. ^ "All Time Apple Cup Scores". Cfbdatawarehouse.com. Retrieved October 11, 2018. ^ "Washington vs. Washington State". www.winsipedia.com. Hazzah LLC. Retrieved January 17, 2018. ^ "Washington vs. Oregon". www.winsipedia.com. Hazzah LLC. Retrieved January 17, 2018. ^ Hollander, Maiah (June 12, 2011). "Washington Huskies Football: 8 Reasons Seattle Is the Best Game-Day Experience". bleacherreport.com. Bleacher Report. Retrieved January 28, 2018. ^ "Husky Stadium". ballparks.com. ballparks.com. January 27, 2018. Retrieved January 28, 2018. ^ "Husky Stadium". www.stadiumsofprofootball.com. Stadiums of Pro Football. November 27, 1920. Retrieved August 14, 2012. ^ Newcomb, Tim (October 23, 2014). "Ground control: The art and science behind creating artificial turf". www.si.com. Sports Illustrated. Retrieved January 28, 2018. ^ "Washington hands Boise St. worst loss under Chris Petersen". www.espn.com. The Associated Press. September 1, 2013. Retrieved September 12, 2016. ^ "University of Washington Official Athletic Site – Facilities". Gohuskies.com. Retrieved August 14, 2012. ^ Huskies players are seen wearing helmets without any logo in 1966, Archived July 1, 2015, at the Wayback Machine 1968, 1971 and 1972. From this page of programs, the "W" logo had appeared by 1975. ^ Condotta, Bob (November 15, 2010). "Huskies planning to "black out UCLA". The Seattle Times. ^ "New era, new look". www.huskiesnewera.com. Washington Athletics. April 18, 2014. Retrieved January 14, 2017. ^ "Pac-12 uniform watch: Washington pulls out gold chrome helmets against ASU". Pac-12. Retrieved December 1, 2018. ^ Jude, Adam (April 10, 2018). "So long, Swoosh: UW Huskies break away from Nike, agree to $119 million apparel deal with Adidas". www.seattletimes.com. The Seattle Times. Retrieved April 10, 2018. ^ Allen, Percy (December 22, 2017). "After nearly four decades, Bob Rondeau has one last game to call: Inside UW's tribute to the 'Voice of the Huskies'". The Seattle Times. Retrieved January 14, 2018. ^ Jennings, Chantel (June 3, 2015). "Numbers you don't mess with in the Pac-12". www.espn.com. ESPN. Retrieved September 12, 2016. ^ "The Kirkby clan leaves its mark on Burlington". Skagit River Journal. 2005. ^ "College Football Hall of Fame Inductees". www.cfbhall.com. Atlanta Hall Management, Inc. Retrieved January 17, 2018. ^ "Gil Dobie (1951) - Hall of Fame". National Football Foundation. ^ "George Wilson (1951) - Hall of Fame". National Football Foundation. ^ "Chuck Carroll (1964) - Hall of Fame". National Football Foundation. ^ "Paul Schwegler (1967) - Hall of Fame". National Football Foundation. ^ "Vic Markov (1976) - Hall of Fame". National Football Foundation. ^ "Hugh McElhenny (1981) - Hall of Fame". National Football Foundation. ^ "Darrell Royal (1983) - Hall of Fame". National Football Foundation. ^ "Don Heinrich (1987) - Hall of Fame". National Football Foundation. ^ "Bob Schloredt (1989) - Hall of Fame". National Football Foundation. ^ "Max Starcevich (1990) - Hall of Fame". National Football Foundation. ^ "Rick Redman (1995) - Hall of Fame". National Football Foundation. ^ "Don James (1997) - Hall of Fame". National Football Foundation. ^ "Steve Emtman (2006) - Hall of Fame". National Football Foundation. ^ "Lincoln Kennedy (2015) - Hall of Fame". National Football Foundation. ^ "Pro Football Hall of Famers". www.profootballhof.com. Pro Football Hall of Fame. Retrieved January 17, 2018. ^ "Hall of Fame players". www.cfhof.ca. Canadian Football Hall Of Fame. Retrieved January 17, 2018. ^ "Rose Bowl Hall of Fame" (PDF). www.tournamentofroses.com. Pasadena Tournament of Roses. Retrieved January 17, 2018. ^ Olson, Eric (September 15, 2010). "Cornhuskers' QB downplays Husky Stadium effect". www.spokesman.com. The Associated Press. Retrieved June 27, 2017. ^ W. Thomas Porter (2013). Go Huskies! : Celebrating the Washington Football Tradition. Triumph Books. pp. 135–. ISBN 978-1-60078-827-7. ^ "Husky Stadium timeline". The Seattle Times. Retrieved June 27, 2017. ^ Dowd, Kevin (November 2, 2011). "Husky Stadium: Biggest moments". www.dailyuw.com. The Daily of the University of Washington. Retrieved June 27, 2017. ^ "On Pac-12 attendance, and wondering how many fans really will be in Reser on Saturday: Issues & Answers". OregonLive.com. Retrieved June 27, 2017. ^ "The best Pac-12 football stadiums to watch a game". KTAR.com. Retrieved June 27, 2017. ^ "Miami's Streak Is Ended: College football: Washington surges for 38-20 victory, the Hurricanes' first loss at Orange Bowl in 59 games". www.latimes.com. The Associated Press. September 25, 1994. ^ Kugiya, Hugo (September 24, 1994). "Huskies Bust Miami Vise – UW Grabs a Piece of History by Ending 'Canes' Streak at 58". The Seattle Times | seattletimes.com. ^ Miller, Ted (November 17, 2003). "Apple Cup of 2002 turned crazy". Seattle Post-Intelligencer. ^ "What the national media are saying about Huskies' dismantling of the Ducks, UW's title chances". October 9, 2016. Retrieved July 31, 2018. ^ "Huskies end losing streak to Oregon in 70-21 rout". October 8, 2016. Retrieved July 31, 2018. ^ "Football Coaching Staff". gohuskies.com. Washington Athletics. Retrieved February 21, 2019. ^ "Washington Huskies Football Schedules Future". fbschedules.com. Retrieved November 15, 2018. The 1923 Washington Huskies football team was an American football team that represented the University of Washington during the 1923 college football season. In its third season under head coach Enoch Bagshaw, the team compiled a 10–1–1 record, finished in second place in the Pacific Coast Conference, tied with Navy in the 1924 Rose Bowl, and outscored all opponents by a combined total of 298 to 58. Wayne Hall was the team captain. 1923 marked the university's adoption of the Huskies nickname. The 1925 Washington Huskies football team was an American football team that represented the University of Washington as a member of the Pacific Coast Conference (PCC) during the 1925 college football season. In its fifth season under head coach Enoch Bagshaw, the team compiled a 10–1–1 record, won the PCC championship, lost to Alabama in the 1926 Rose Bowl, and outscored all opponents by a total of 480 to 59.Fullback Elmer Tesreau was the team captain. Halfback Wildcat Wilson was selected as a consensus first-team player on the 1925 All-America team. Other key players on the team included quarterback George Guttormsen, tackle Walden Erickson, guard Egbert Brix, center Douglas Bonamy, and ends Judson Cutting and Clifford Marker. The 1926 Washington Huskies football team was an American football team that represented the University of Washington during the 1926 college football season. In its sixth season under head coach Enoch Bagshaw, the team compiled an 8–2 record, finished in fifth place in the Pacific Coast Conference, and outscored all opponents by a combined total of 213 to 60. George Guttormsen was the team captain. The 1936 Washington Huskies football team was an American football team that represented the University of Washington during the 1936 college football season. In its seventh season under head coach Jimmy Phelan, the team compiled a 7–2–1 record, finished in first place in the Pacific Coast Conference, was ranked #5 in the final AP Poll, lost to Pittsburgh in the 1937 Rose Bowl, and outscored all opponents by a combined total of 148 to 56. Chuck Bond was the team captain. The 1938 Washington Huskies football team was an American football team that represented the University of Washington during the 1938 college football season. In its ninth season under head coach Jimmy Phelan, the team compiled a 3–5–1 record, finished in sixth place in the Pacific Coast Conference, and was outscored by its opponents by a combined total of 83 to 68. Frank Peters was the team captain. The 1947 Washington Huskies football team was an American football team that represented the University of Washington as a member of the Pacific Coast Conference (PCC) during the 1947 college football season. In its sixth season under head coach Ralph Welch, the team compiled a 3–6 record (2–5 against PCC opponents), finished seventh in the PCC, and was outscored by a total of 99 to 98. Gail Bruce was the team captain. The 1959 Washington Huskies football team represented the University of Washington during the 1959 college football season. Home games were played on campus in Seattle at Husky Stadium. In its third season under head coach Jim Owens, Washington was 9–1 in the regular season and 3–1 in the Athletic Association of Western Universities, one of three co-champions of the five-team AAWU in its inaugural year. The Pacific Coast Conference (PCC) had disbanded in the spring, and the AAWU consisted of the four teams from state of California and the Huskies. The other four PCC teams from the north (Oregon, Oregon State, Washington State, and Idaho) were independent for several years. (Washington defeated all four this season.) The Cougars joined the league in 1962 and the Oregon schools in 1964; it was later renamed the Pacific-8 Conference. Led on the field by junior All-American quarterback Bob Schloredt, the Huskies started the season unranked and gained the Rose Bowl berth. Eighth-ranked, they were a 6½-point underdog to the #6 Wisconsin Badgers (7–2), the champions of the Big Ten. On New Year's Day in Pasadena, Washington jumped out to a 17–0 lead in the first quarter and won in a 44–8 rout to finish the season at 10–1. The Rose Bowl victory was the first for a West Coast team in seven years, and only the second since the end of World War II; the loser both times was Wisconsin.Washington outscored all opponents by a combined total of 253 to 73, and outside the sole loss to USC, they allowed no more than twelve points in each of their other ten games, with four shutouts. The final rankings in this era were released in early December, at the end of the regular season and prior to the bowl games. The 1963 Washington Huskies football team was an American football team that represented the University of Washington during the 1963 college football season. Under seventh-year head coach Jim Owens, the team lost their first three games, compiled a 6–4 record in the regular season, and won the Athletic Association of Western Universities (AAWU, a.k.a. "Big Six") at 4–1. On New Year's Day at the Rose Bowl, the Huskies led early but lost 17–7 to third-ranked Illinois. It was the third Rose Bowl for Washington under Owens and their first loss; they had won consecutive games in January 1960 and 1961. The Huskies did not return to Pasadena for fourteen years, a victory in January 1978 in head coach Don James' third season. Halfback Dave Kopay and center John Stupey were the team captains. In its eleven games, Washington outscored its opponents 183 to 141. The 1973 Washington Huskies football team was an American football team that represented the University of Washington during the 1973 NCAA Division I football season. In its 17th season under head coach Jim Owens, the team compiled a 2–9 record, finished in last place in the Pacific-8 Conference, and was outscored by its opponents by a combined total of 376 to 218. Dave Pear was selected as the team's most valuable player. The 1977 Washington Huskies football team represented the University of Washington in the 1977 NCAA Division I football season as a member of the Pacific-8 Conference (Pac-8). The Huskies were led by third-year head coach Don James and played their home games at Husky Stadium in Seattle. They finished the regular season at 7–4 overall, were champions of the Pac-8 at 6–1, and earned a trip to the Rose Bowl on January 2. The Huskies were fourteen-point underdogs to #4 Michigan, but upset the Wolverines 27–20. The 1980 Washington Huskies football team was an American football team that represented the University of Washington during the 1980 NCAA Division I-A football season. In its sixth season under head coach Don James, the team compiled a 9–2 record in the regular season and were Pacific-10 Conference champions at 6–1. They returned to the Rose Bowl, but fell to favored Michigan; for the season Washington outscored its opponents 333 to 198. Both regular season losses were at home at Husky Stadium. The sole conference loss was to border rival Oregon, who last defeated the Huskies in 1973; it was the first loss for James against a Northwest team. In his eighteen games against the Ducks, James lost only three; the other two were in 1987 and 1988. The Huskies' winning streak over Washington State in the Apple Cup reached seven with another win in Spokane; it has not been held there since. Senior quarterback Tom Flick was selected as the team's most valuable player; Flick, Ken Gardner, Rusty Olsen, and Randy Van Divier were the team captains. The 1991 Washington Huskies football team represented the University of Washington in the 1991 NCAA Division I-A football season. Head coach Don James, in his 17th season at Washington, was assisted by coordinators Keith Gilbertson (offense) and Jim Lambright (defense), both head coaches themselves within two years. The 1991 team was arguably the finest team in school history and split the national championship with the Miami Hurricanes, who were also 12–0, and won the AP Poll by four votes, while Washington took the coaches' poll by nine. Washington could not have played Miami in a bowl game because the Pac-10 champion was bound by contract to play in the Rose Bowl against the Big Ten champion. The Huskies soundly defeated no. 4 Michigan 34–14 in the 1992 Rose Bowl; the final score differential was narrowed by a late touchdown by Tyrone Wheatley of Michigan. With a minute remaining in the game, Washington was on the Michigan five-yard line, but opted to stay on the ground and run out the clock with the third-string quarterback leading the offense.Eleven Huskies were selected in the 1992 NFL Draft, led by Steve Emtman, a dominating yet under-recruited defensive tackle from Cheney. Emtman won both the Lombardi Award and the Outland Trophy, and finished fourth in the Heisman Trophy balloting, won by Desmond Howard of Michigan. Defensive back Dana Hall was also selected in the first round. A fantasy article in Sports Illustrated titled "The Dream Game" had the Huskies narrowly defeat Miami in a playoff. The 1992 Washington Huskies football team was an American football team that represented the University of Washington during the 1992 NCAA Division I-A football season. In its eighteenth and final season under head coach Don James, the defending national champion Huskies won their first eight games and took the Pacific-10 Conference title for the third consecutive season.Attempting to win a third straight Rose Bowl, the Huskies lost to Michigan by seven points and finished with a 9–3 record. Washington outscored its opponents by a combined total of 337 to 186.Dave Hoffmann was selected as the team's most valuable player. Hoffmann, Mark Brunell, Lincoln Kennedy, and Shane Pahukoa were the team captains. The 1995 Washington Huskies football team was an American football team that represented the University of Washington during the 1995 NCAA Division I-A football season. In its third season under head coach Jim Lambright, the team compiled a 7–4–1 record, finished in a tie with USC for first place in the Pacific-10 Conference, and outscored its opponents by a combined total of 312 to 280. Quarterback Damon Huard was selected as the team's most valuable player. Ernie Conwell, Deke Devers, Stephen Hoffmann, and Richard Thomas were the team captains. The 1999 Washington Huskies football team represented the University of Washington in the 1999 NCAA Division I-A football season. The Huskies were led by first year head coach Rick Neuheisel and played their home games at Husky Stadium. They played as a member of the Pac-10. They finished the season 7–5, 6-2 in Pac-10 play to finish in a tie for second place. The 2004 Washington Huskies football team was an American football team that represented the University of Washington during the 2004 NCAA Division I-A football season. In its second season under head coach Keith Gilbertson, the team compiled a 1–10 record, finished in last place in the Pacific-10 Conference, and was outscored by its opponents by a combined total of 334 to 154. This was Washington's first losing season since 1976.